Maybe it’s the relatively close proximity from his hometown of Moscow, Idaho to the 49th parallel, but Josh Ritter has always seemed to exhibit a special fondness for Canada and judging from the sold-out Horseshoe Tavern on Thursday night, Canada loves him too. 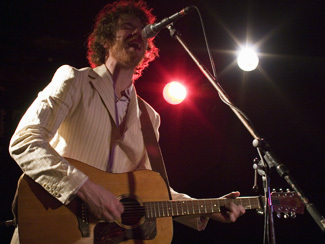 Taking a break from recording the follow-up to his splendid 2006 release The Animal Years, Ritter has been touring across North America in a solo acoustic format playing smaller venues than he would normally, much to the delight of those in attendance. Opening for him on this evening was Julie Fader, whom I didn’t recognize until she took the stage – once upon a time and under her real name of Julie MacDonald, she fronted Hamilton space-rock band Flux AD whose career I followed a decade ago. Since then, she went on to tour in Sarah Harmer’s band which is where she likely met Ritter (he opened on tour for Harmer a few years back). Her new solo material is rather conventional acoustic singer-songwriter fare, though the textural guitar and keys work from former Flux AD bandmate Graham Walsh helped give it an extra dimension. On the plus side, her voice is still simultaneously crystalline and weary, but on the minus side, her lyrics are almost painfully plain and direct. That could well be by design, but a little metaphor or inscrutability could go a long way. As a songwriter, Ritter wears his influences a bit on his sleeve with obvious nods to Dylan and Springsteen in his work, but rather than assuming the voice of the former’s barbed-tongued commentator or the latter’s blue-collar everyman, he instead comes across as the earnest collegian – intelligent, optimistic and romantic (if perhaps a bit bruised). Clad in a white pinstriped suit, full beard and a wide grin, Ritter bounded onstage at 11PM and spent the next hour and half communing and commiserating with the crowd. The dynamic between performer and audience was pretty much as you’d hope for in such an environment, with he alternately storytelling or just conversing with his fans between songs – casual, intimate and genuine. The set list played out pretty much exactly as you’d expect – leaning heavily on The Animal Years with the expansive “Thin Blue Flame” as the centrepiece/finale (or second last song, anyways) but also including some older material – at least some from Hello Starling, maybe even further back, I don’t know the first two records – and some covers. A Springsteen quote here, Waits there, and once again his take on Leonard Cohen’s “Chelsea Hotel No 2”. All of it sounded marvelous, Ritter proving himself to be an artist who can make a solo acoustic show dynamic and engaging and this is coming from someone who’s a bit of a hard sell on the format. While I certainly won’t complain when Ritter comes back to town with his band, whenever that would be, I also wouldn’t be disappointed if he left them at home again. The Winnipeg Sun and Georgia Straight talk to Ritter about the roots of his songcraft and the politics of The Animal Years, respectively. Filter has posted online their recent cover story pitting The Office‘s John Krasinski against The Shins. Okay, it’s not so much a pitting against as a lot of mutual back-patting (and in Krasinski’s case, self-back patting). An interesting idea in theory but not so much in practice. Elsewhere, The Georgia Straight declares James Mercer to be not cocky, Dave Hernandez talks to The Seattle Times and The Salt Lake Tribune about debuting at #2 on the Billboard charts and Marty Crandall chats with The Seattle PI. And The Wall Street Journal compares the band to former SubPop meal tickets Nirvana. The Shins are at the Kool Haus on St Patrick’s Day. Saturday Night Live – Rainn Wilson, aka Dwight K Schrute, hosts and Arcade Fire are the musical guest. For reals. Mew return to Toronto on March 26 for a show at the Mod Club, Scots Aerogramme and The Twilight Sad team up with Hamilton’s A Northern Chorus for a show at the ElMon on April 6 ($12 advance) and The Wooden Stars mark their return to active duty with a CD release show at the Horseshoe on April 19, tickets $10. Their first album in almost eight years, People Are Different, is out April 10. I used to be in a chess club with one of the guys in The Wooden Stars. True story. And to celebrate the release of The Reminder on May 1, Feist will perform at the Grand Old Lady of Shuter Street, Massey Hall, on May 26. The first single from the album, “My Moon My Man”, is making the rounds on ye olde internet – it sounds great and that show would surely be something to see. And speaking of Massey Hall, there’s some video footage available from the DVD component of the forthcoming Neil Young release Live At Massey Hall, due out March 13. Pitchfork reports that Young is already at work on his next studio album, so even though 2007 will be the year that he finally journeys through his past (Archives is out this Fall), he’s still moving ahead into the future. Update: Nix on that new album info – for some reason Google News grabbed a PF headline two years old and served it up as current and I didn’t read closely. Until further notice, Neil will be sitting around the ranch, just hanging out. The music is great, perhaps a bit more of a mellow vibe than Alligator overall — perhaps somewhere between the Cherry Tree mellow/beautiful sound and the Alligator more up-beat/rocking sound. Most notable about the record is that it has the best arrangements they’ve done, by far, and there’s some unexpected & wonderful new elements that you haven’t heard before. Think trumpets, and other brass instruments; increased use of female backing vocals; excellent piano bits by Thomas Bartlett (aka Doveman & sideman to David Byrne, Bebel Gilberto, Laurie Anderson, The Frames, Yoko Ono); and possible even some playing by band friend, Sufjan Stevens. Thematically it intertwines songs about love, songs about war, and songs about office life. Or, more correctly, songs that are about all three topics at the same time. Sounds plausible. The record is still untitled but should be out on May 22. And not surprisingly, I spent a good chunk of this weekend perusing the SxSW schedule and while I’ve got a preliminary grid finished, I’m not committing to anything until I’ve gone through some/all of the MP3s provided to assist in the decision making process. HearYa has consolidated links to all with streaming functionality on one convenient page while Donewaiting directs us to the 3.1GB torrent of all available MP3s. You know, I don’t even know that I have that much space on my iPod. Wow, what a grab bag of a post Frank. Thank you. Julie is a pretty fantastic musician in my humble opinion, I think we will see a lot more from here. Playing Wurlitzer, flute, and melodica in Sarah’s band was pretty impressive to me at least. I first saw Josh Ritter backing Sarah Harmer at RiverRun in Guelph, which was a great venue for him. For the encore, Sarah had him come out to join her band on I’m A Mountain – the namesake song for her tour. My favourite songs are Snow Is Gone and Wings, but I have some delving into his catalogue yet to do. Thanks for the Chelsea Hotel cover, I love that song too. And that didn’t take you long to find the super-gig torrent – I got last years and am still sampling stuff from it. Looking forward to your coverage this year – last year’s was great and it’s all inspiring me to think about a trip in ’08. Thanks for the shout out. You should really check out Golden Age of Radio by Ritter. My favorite of them all.